When you are craving both breakfast and lunch, these green chile cheese waffles are the perfect compromise! 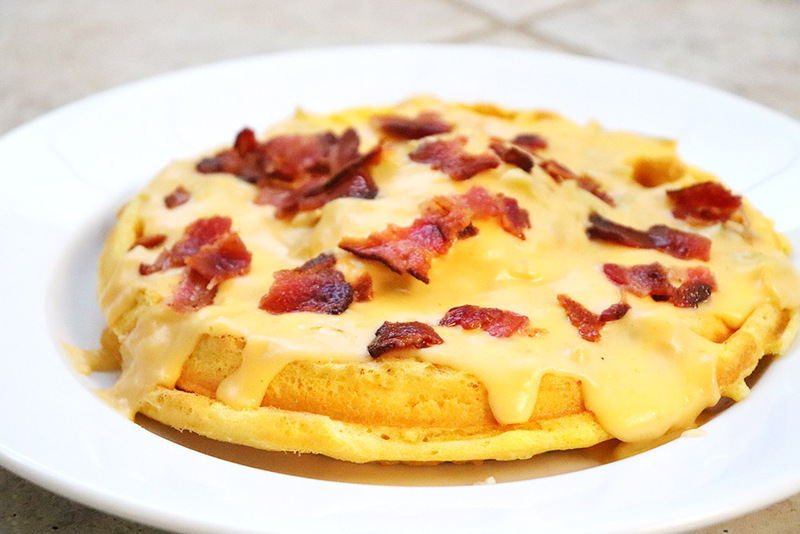 They’re made with a cornbread waffle, topped with a green chile cheese queso, huevos, and bacon. Keep reading to learn how to make it! On the third date with my boyfriend, he took me to a restaurant in Nob Hill in Albuquerque called Tia B’s La Waffleria. While we waited in an impressive line, we looked over the menu and I was trying to stop myself from drooling (because: 3rd date). They had a mix of savory and sweet waffles, many topped with red and green chile. 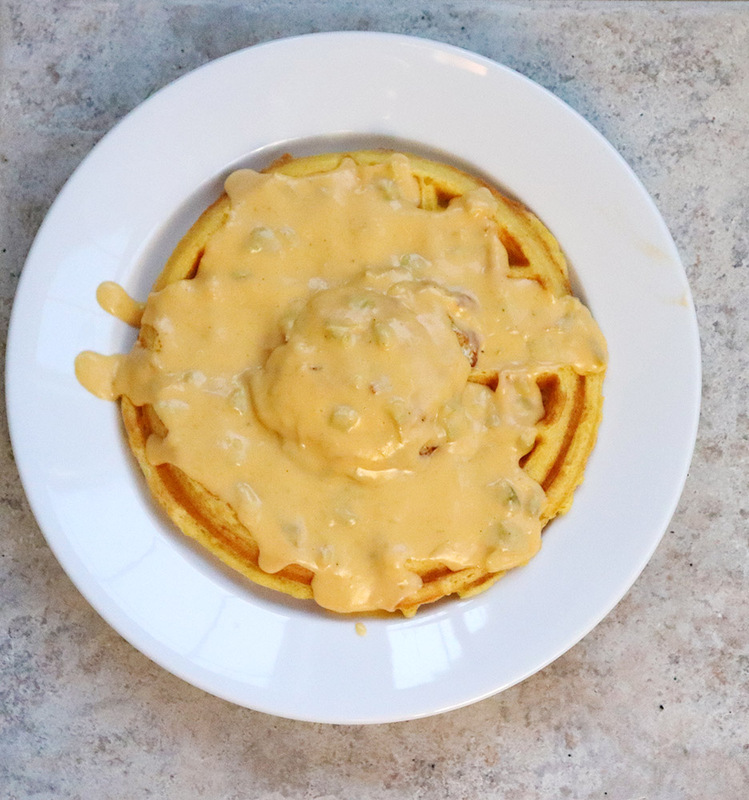 I ended up choosing their Waffle Benitos, which is a buttermilk waffle that has huevos (eggs) on top, and smothered with a green chile cream sauce. And let me tell you, it does not disappoint!! Like I do with every amazing New Mexican dish that I try, I wanted to see if I could make something similar at home. 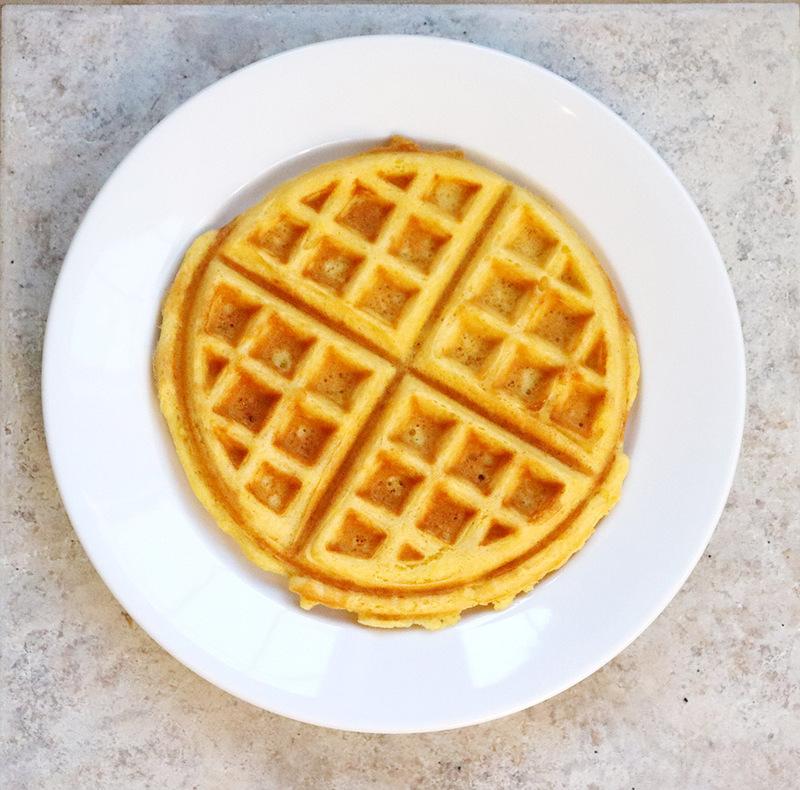 I adjusted a few things — using a cornbread waffle rather than a buttermilk waffle. I also topped it with bacon, because bacon. 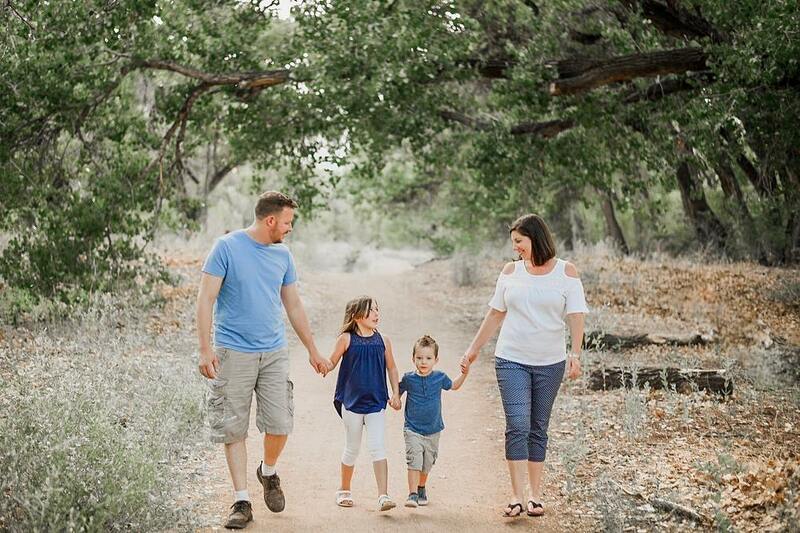 All in all, it turned out great! It’s quite a bit of work, if you make all of the ingredients from scratch, but if you enjoy cooking, it’s a fun experience. And, if you happen to live near Albuquerque and haven’t tried Tia B’s — you definitely need to! Their food is amazing. My second favorite waffle is their Waffle Rancheros — blue corn waffle, spicy red chile, cheese, carne adovada… YUM! 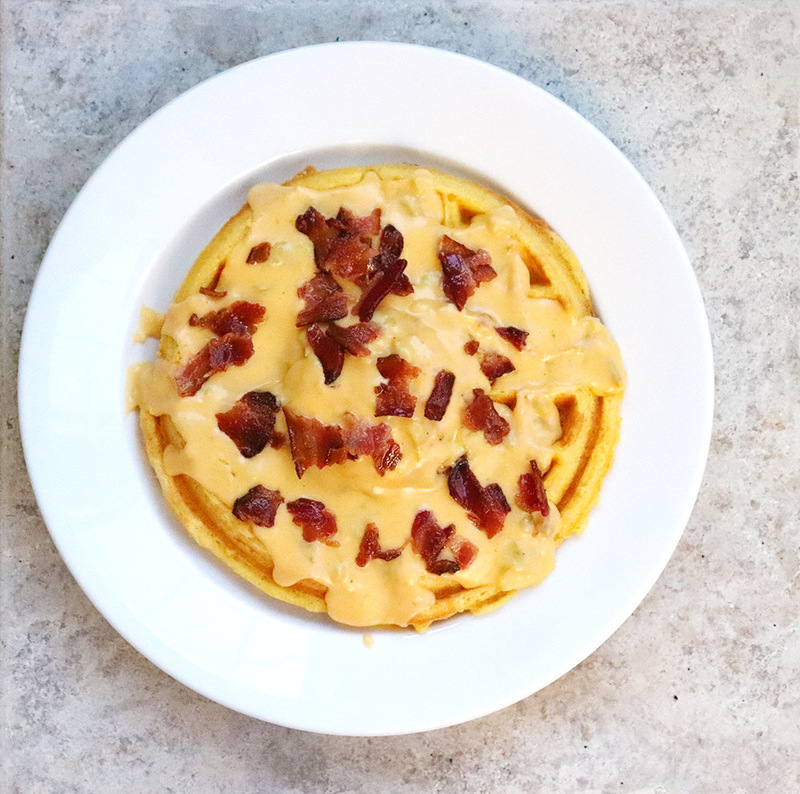 To make these green chile cheese waffles, you’ll start by making a cornbread waffle batter with cornmeal, flour, baking powder, baking soda, salt, and buttermilk. If you don’t have a waffle maker, you can pick one up on Amazon for less than $20 here. Cook the cornbread waffles until done, and cover with foil to keep them warm. Next, the waffle are topped with over-easy eggs. If you prefer over-medium, hard boiled, or scrambled eggs, I’m sure that would work too! 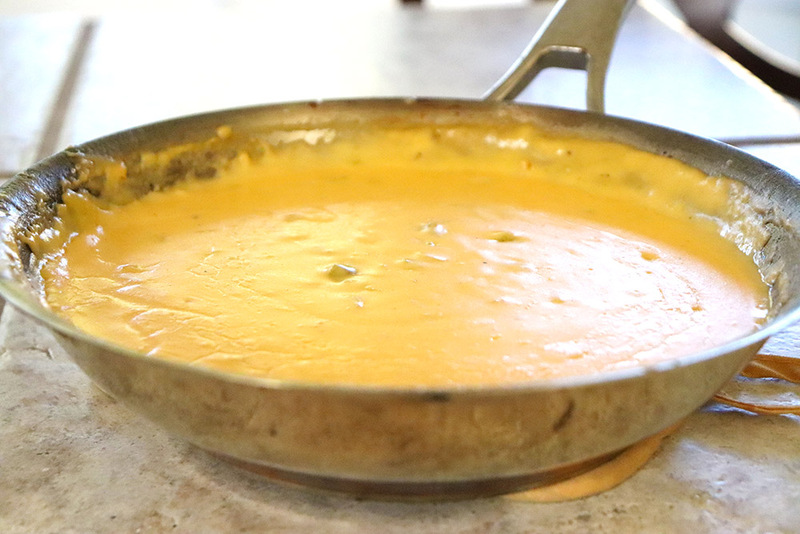 The egg is stopped by warm green chile cheese sauce. This beauty gets topped with cooked crumbled bacon. Next, you’ll promptly devour the entire thing. You’ve worked hard, and you deserve it! Preheat your waffle iron, and spray generously. Combine dry ingredients in a large bowl, mixing well. In a separate bowl, combine buttermilk, butter, and eggs. Slowly add the wet ingredients to the dry ingredients and mix until just blended. Add 1/2 - 3/4 cup batter to the waffle iron, and cook until cooked through, about 5 minutes. Repeat with remaining batter. Melt butter in a saucepan over medium heat. Whisk in flour, stirring until smooth. Cook a couple minutes, stirring frequently. Slowly add in milk, whisking well after each addition, until sauce comes together. Continue cooking until mix begins to thicken, about 3 minutes. Reduce heat to low, then add in remaining ingredients. Mix well, and cook until warmed through, about 3 minutes. Cook eggs as desired. Cook bacon until crisp. Crumble bacon into bite-size pieces. 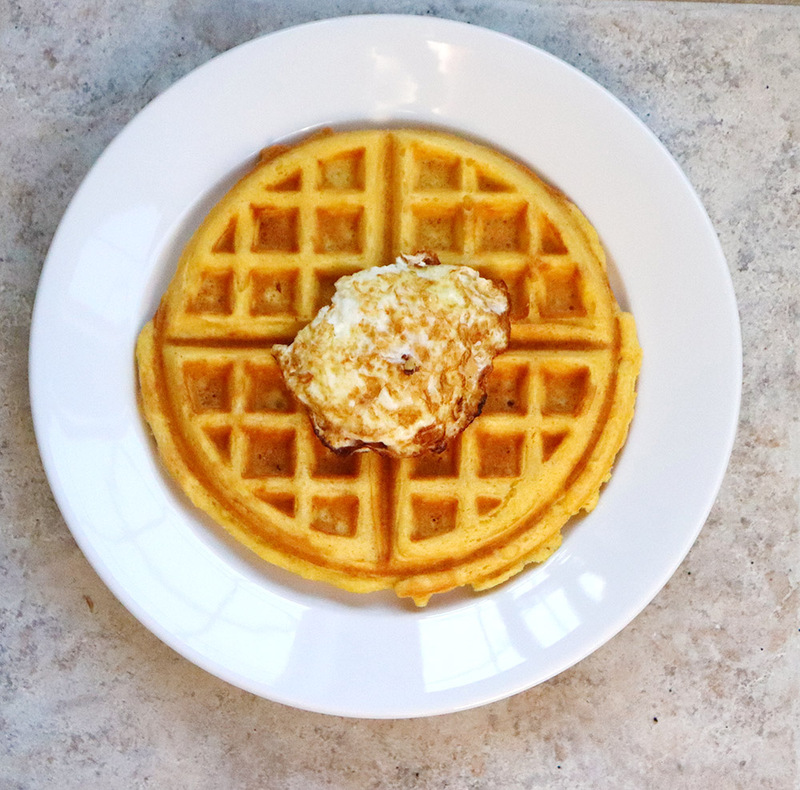 Top each waffle with two eggs. 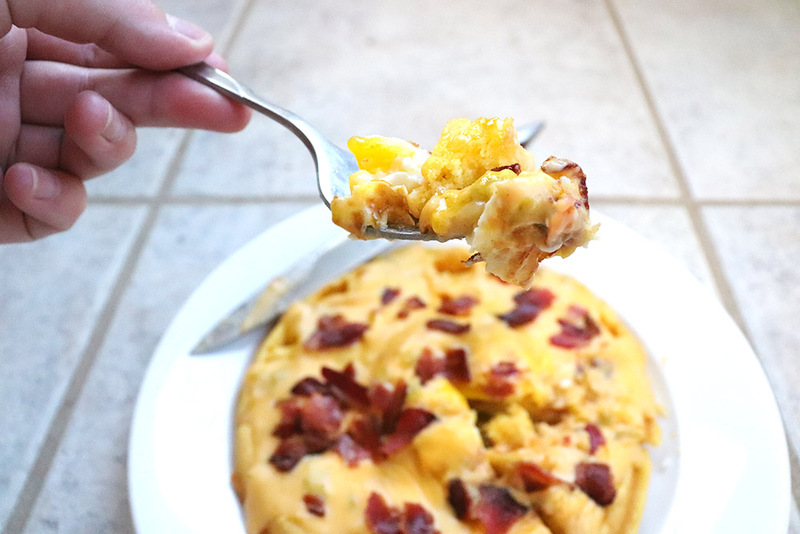 Ladle on 1/4 cup cheese, then top with crumbled bacon. .
Pin this image to your favorite Green Chile board! Just click on the image below.